Technical programs at Dakota offer a wide array of career options. Students attending WDTI know that they can get the right training that may lead to immediate employment, a good salary and professional satisfaction. Students are learning the skills they will need to enter the job market for the first time, to make a career change, to advance more quickly with their current employer, or to keep pace with technological change. The programs at Dakota are in step not only with today's job requirements, but also with the developments that will affect students in the future. Instructors are in touch with the realities of the working world. The equipment, facilities, and courses for each program are reviewed annually with the assistance of professional advisory board committee members. 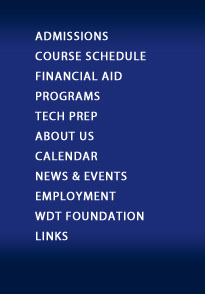 At Western Dakota Technical Institute, each credit course within an eligible Title IV program may be substituted in the Institute's AAS programs, which are two academic years in length. The number of restrictive electives to be transferred into any of the AAS programs may be limited, dependent upon the specific requirements of the program.